This picture is from Jackie at Jackie’s Quilting Chronicles podcast and CVQuiltworks. 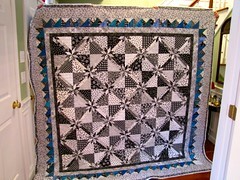 I really like this black and white quilt with the hints of blue. Hunter’s Star is the pattern. I would love to see this in person. Actually, this is also a test post to see if I can blog directly from flickr. You are welcome, Darla!! I didn’t know you could post from Flckr, I may have to give it a shot! Pretty easy, you have to set up your blog first, but it didn’t seem to take any time at all. By the way, glad that you like the quilt too! Love the border — any ideas on how that is done and measurements in comparison to the block?